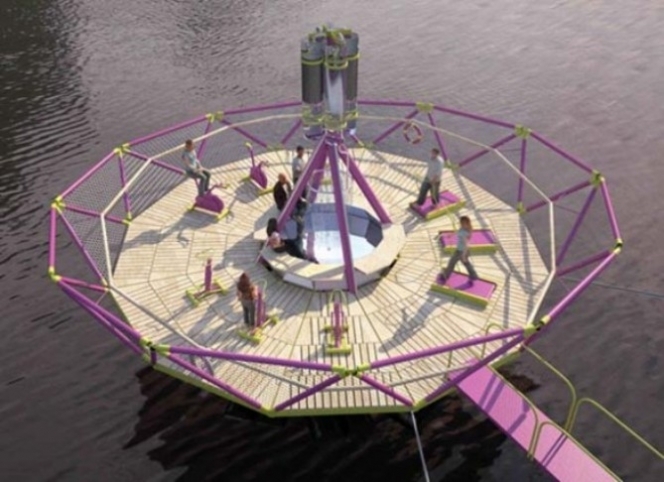 Summary: The island is a floating platform with nine outdoor fitness machines pumping polluted Vistula water through four filters to a basin placed in the center of the island. The platform will be floating on the Vistula river in the center of Warsaw. Need: To visualize the positive effect of a common effort of citizens in changing their »unchangeable« toxic environment, a remnant of the communist era of industrialization, by showing the process and the outcome in the form of drinkable water. Detailed description: The inhabitants of Warsaw started to take an interest in the river in their pursuit of healthier lifestyle, but Vistula, the last large European unregulated river, has remained polluted by industry and agriculture for the last 30 years. The island is a modular steel structure on recycled steel barrels with nine outdoor fitness machines on an oak deck of 79 square meters. The machines produce pressure in pipes connecting the river with filters placed 3 meters above the deck. The filters are: sand, carbon and inverted osmosis, along with a UV lamp. The purified water falls onto an stainless steel basin with an oak-finished bench, on which people can sit, wash their feet, and drink the water coming from the filters located above. The concept is the result of a personal initiative of Jakub Szczesny, organizational support from Fundacja Bec Zmiana, and financial help from the City of Warsaw’s Bureau of Culture. It includes architectural, structural, water treatment and infographic research. It was completed at the beginning of September 2009, published in a book, written about in Warsaw newspapers, and in international blogs gaining wide public acclaim and interest in further implementations in Gdansk and the St. Lawrence River Community.